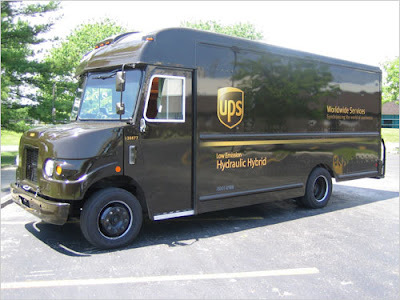 Thanks to hybrid hydraulics, there is something especially awesome in the power of the next generation of garbage and delivery trucks that will soon be rolling through your neighborhood. Although they may still look like big, bulky trucks, inside they boast hydraulic power-train systems that are significantly more energy and fuel efficient than similar conventional or gasoline-electric hybrid vehicles. 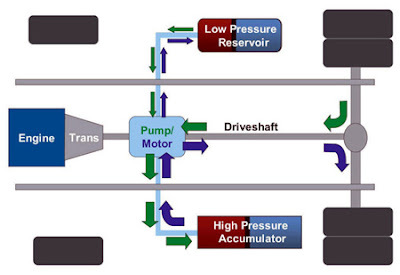 If hybrid hydraulics prove their mettle for more industrial uses, cars may not be far behind. The diesel pump pushes hydraulic fluid into the accumulator to reach pressures of up to 385 kilograms per square centimeter. By pressing down on the accelerator, the driver releases that pressurized fluid from the accumulator to then drive the hydraulic motor. The best analogy might be a person operating a handheld air pump to pressurize a balloon, says Joe Kovach, group vice president of technology and innovation for Cleveland-based Parker Hannifin Corp.'s Hydraulics Group. In this comparison the person equals the pump, which drives air (technically a fluid) into the balloon, and the balloon represents the accumulator. The energy that can be harnessed comes from the force of the air released from the balloon. "We think it's quite possibly the most cost-effective technology to achieve high fuel efficiency with low carbon emissions," says John Kargul, director of technology transfer with the U.S. Environmental Protection Agency's (EPA) Office of Transportation and Air Quality in Ann Arbor, Mich. Since the early 1990s Kargul and his research team have been testing hybrid hydraulic systems as a core drive-train technology for roughly 20 different sizes of vehicles—from 1,500-kilogram passenger cars to 18,000-kilogram commercial trucks. They also partner with automotive manufacturers including Ford Motor Co., Parker Hannifin and Eaton Corp. as well as delivery companies UPS and FedEx to design, build and field-test prototype vehicles. They have found several compelling reasons to employ hybrid hydraulic systems for a range of larger, heavier vehicles—trucks and buses as well as military, construction and dock-loading equipment. For starters, these systems can store and discharge energy much faster than electric batteries. They provide 10 times the power in the same size and space as a hybrid electrical system. Perhaps most vital of all, these vehicles have demonstrated up to 50 percent fuel reduction compared with the latest, most fuel-efficient conventional garbage trucks, Kovach says, adding that recent field trials of trucks equipped with Parker Hannifin's new RunWise hydraulic system in Detroit, Las Vegas and Miami even "freaked out" the garbage truck drivers. "They kept saying, 'There's something wrong with the gas pump,'" says Kovach, whose company will roll out a dozen new hybrid hydraulic refuse trucks in Miami in September. "They were used to putting 44 gallons of gas or diesel fuel in every day, and now they were putting in an average of 22 gallons of fuel." Additionally, because they draw power from the pressure stored in the accumulator when fully charged, hybrid hydraulic vehicles can shut off their engines and drive for up to 0.2 kilometer before turning them back on. This is especially handy for start-and-stop delivery truck routes. Moreover, rather than have a fleet of trucks fire up their engines simultaneously in the morning, the trucks can drive off for 0.2 kilometer first, eliminating that concentration of noise and exhaust, much to the relief of their neighbors and the EPA. Hybrid hydraulic systems in trucks actually date back to the 1960s, long before hybrid gas-electric systems were available. Several key deficiencies, however, relegated the technology to the sidelines in favor of gas-electrics for a couple of decades. Primarily, hydraulic accumulators were made of steel, making them extremely heavy. Early hydraulic systems were also more complicated and harder to control, especially because the viscosity, or resistance, of the hydraulic fluid changes depending on its temperature. During the past decade, though, improvements in several areas have eliminated those challenges. Accumulators are now made of the same lightweight, carbon-composite materials used to fabricate jet fighter planes, and advanced computerized systems have simplified the control issues. More efficient pump systems, leak-proof components, and ecofriendly hydraulic fluid formulas have reduced leakage concerns as well, Kovach says. 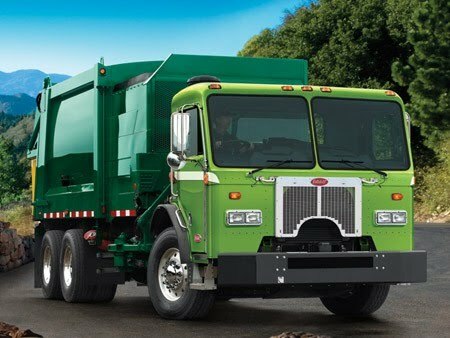 Now that these vehicles are beginning to appear on the market—Eaton Corp. has several models of trucks, and Parker plans to roll out their delivery trucks and dock-handling equipment in 2011—smaller applications for hybrid hydraulics are likewise being developed for wind and wave energy equipment as well as bicycles and rickshaws. Carmaker BMW already has several hybrid models that incorporate hydraulic components in development and close to the preproduction stage. Peter Achten, owner and CEO of Innovation Associates, an engineering company in the Netherlands, sees the trend continuing in the U.S. and Europe, with growth in several emerging markets like South America, China and India where the average customer cannot afford to pay for a vehicle that requires a battery that costs $5,000 or more. "The hybrid hydraulic will come to the automobile," Achten says. "It is the only way to have a strong reduction in fuel consumption and CO2 emissions without the cost and weight increase of electric batteries, power converters, motors and generators." I agree about adoption of hydraulic system when torque and pressure are needed. I would like to know more about the process, system and tube circuit. I know about pressure accumulator for hydropneumatic system, but not for a pure hydraulic circuit. Pascal's principle and thermodynamic laws remain the same.